Upright stance and walking deploy all the muscles in the body, not only those in our legs. When we are learning to stand and to walk we are bringing our entire being into a vertical. It is a state of instability which demands our constant adjustment of balance, as opposed to the significantly more stable situation of four-legged animals. Even standing still thus becomes a continual activity – a movement. This instability will be observed in the relationship between what is up and what is down, what is in front and what behind, the relationship between the right and the left side. The forces and principles active in the shaping of our physical body and its uprightness in space are then used in our actions and in forming relationships. While movement is more connected to space, speech is more connected to time. When we are learning to speak we are at the same time creating a relationship to time. For the creation of speech it is not sufficient to merely speak. If children are to understand the meaning of speech there has to be a connection between what is said and what is happening, speech must be matched with corresponding acts and deeds – with movement. Thinking takes place outside of both space and time. Thinking is intangible and free. It can be said that thinking is a certain type of movement of the spirit. With the aid of Eurythmy we shall try to translate this movement into the fabric of time and space in a way perceptible by our senses. All of the work groups offered at the conference offer incentives for further work in our professions. However, each participant can only take part in two work groups and deciding which one he or she will a join and which have to be left out that particular year is thus a difficult decision. Therefore we have decided to hold an event on the last day of our conference, a forum where each of the lecturers will have few minutes to briefly introduce the core thoughts of his or her respective work group. We hope to gain an hour full of concentrated thoughts, highlights of this year: an opportunity for all the participants to experience each of the lecturers. All lectures and work groups are in Czech or German, translation to the other language is always provided. English translation is only available after prior individual agreement. Therefore we kindly advise you to contact us via email with inquiries concerning English translation. The number of participants is usually only limited in work groups that have practical exercises that demand a certain amount of space and material. Unlimited groups are of course limited by the sizes of classrooms, but this limitation is hardly ever a problem in reality. Listed are those occupation groups this work group is primarily targeted at. In this work group we will firstly focus on the period immediately after birth. During this time a series of crucial physiological changes takes place. Furthermore, we will discuss the period of nursing and follow the gradual development of the child towards kindergarten age. Observing the development in the first three years of a child’s life we will address the adoption of upright walking, speech and finally also the capability of experiencing oneself – the child’s Ego. Apart from those three stages of physiological development we will in addition focus on dealing with fevers and childhood illnesses, on the rational consideration of the issue of child vaccination and on the general aspects of prevention relevant for this stage of child development. This work group was initiated by a group of representatives of several Waldorf schools within the Czech Republic. In their meetings they have been intensively dealing with the issue of determining the maturity of children and their sufficient fitness for enrolment into the first grade of primary school. This group has expressed their wish to deepen their knowledge in this field and to discuss the matter from a medicinal point of view. Tomáš Zdražil will begin the work of the group by summarizing the theoretical principles of Waldorf education regarding this matter. Furthermore he will briefly address the practical applications used by German Waldorf schools (day 1). Experienced school doctor Elisabeth Frank (days 2-4) and dentist Claus Haupt (days 5-6) will then discuss the matter from the perspective of medicine. Different aspects of nutrition will be discussed using the threefoldness of plants and their relationship to man in line with the description provided by Rudolf Steiner in his work on curative education. Questions will be asked about nutrition in different stages of human life. We will study, both practically – using our senses – and theoretically, the different qualities of specific types of food from the perspective of Anthroposophy and natural sciences. What is known about breast milk, about sugar and various sweeteners, about the body’s management of warmth? What is the experience with nutrition of people on the autistic spectrum, people with Down syndrome or of hyperactive children (ADHD)? What is the basis of child nutrition? These are some of the questions that will be addressed in this work group. How can we support our children in developing their true individuality and thus fulfilling the life goals that brought them into the world? In order to grow sufficient roots, children need a safe and comfortable home – a protective space where they can regain life forces (maternal aspect) – and a solid support on their path towards embracing their emotional life (paternal aspect). Furthermore, children need to establish a connection to the natural world, to have enough spiritual nurturing in the form of meaningful stories and to experience their own activity and creativity in their homes, at school and in the nature. It is also very important for children to experience their connections to other people, to culture and to the time through daily, weekly, monthly and yearly festivals and rituals. In this work group we are going to create, to tell stories, to sing and to use clay modelling. On the basis of Anthroposophical anthropology we will work our way through specific methods and exercises of therapeutic clay modelling. Only after a child has reached school maturity he or she is able to deploy forces that enable the child to grasp more complex intellectual processes. It is also only now that child reaches the ability to understand the processes of three-dimensional modelling. We will focus on choosing the appropriate modelling techniques, exercises and themes that can rather develop than overload the newly acquired skills between the ages 6 and 9. How can we discover the weak spots in the child’s constitution using such modelling techniques? How can we use modelling to strengthen the healthy development and the right formation of the rhythmical system, of the digestive system and the nervous system? What exceptional possibilities are offered by modelling with feet? How is it possible to use play therapy in order to diagnose the damaged aspects of a child’s soul and how can we use it to heal them? What activities support the creation of community and what activities can strengthen the social competences of a child? Children in general love clay modelling because it provides them with a sense of security and structure and it strengthens their inner basis. Clay modelling also unfolds the ability to express oneself which is one of the foundations of a healthy human development. At the beginning we will focus on the period when a child begins school – the ending of the first and the beginning of the second seven year period. This is a time of an important milestone in the external biography of a child, but we will concentrate rather on the more hidden aspects of this period. Afterwards, we shall move on to the next crucial threshold in child biography – the ninth year, so called period of Rubicon. The focus will be mostly on the chronic illnesses that present themselves in this period of life such as asthma, eczema and allergies. In addition, we will discuss some of the available cures that can be readily used at home. Tomáš Zdražil: In Waldorf pedagogy education is regarded as a curative process. What is the understanding of health and illness according to this pedagogical perspective? What are the main factors that undermine child’s health and how can they be counteracted by curative education, by teaching and by school? 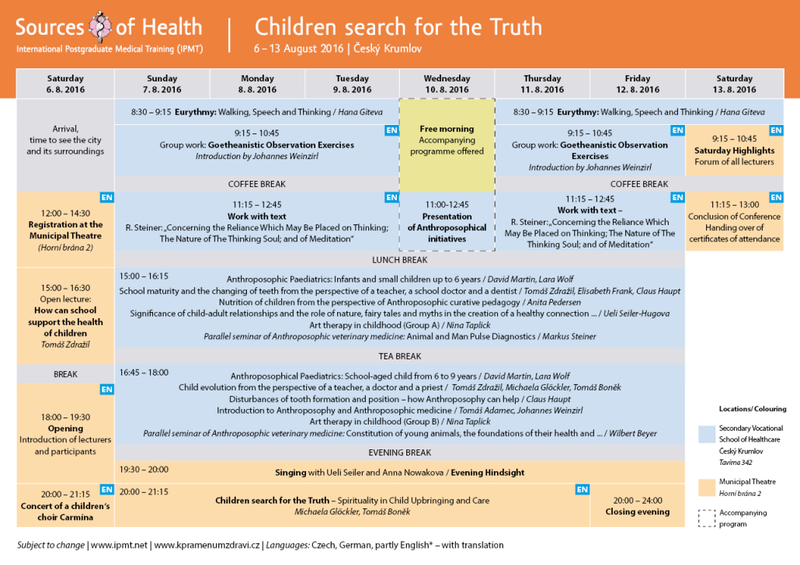 What conclusions can be drawn from the empirical research into the health of Waldorf pupils? What are the impulses Anthroposophy offers in regard to the health of Waldorf teachers? Michaela Glöckler: Illness is a natural counterpart of human development. No child can be spared the experience of diarrhoea or an acute infection of the respiratory tract, while old age is accompanied by chronic illnesses that point to the weariness of organism and the process of aging. Integral to life is also the occurrence of various adjustment disorders and mental illnesses. However, some fateful illnesses only occur in some children or young people. If we are to prevent particular illnesses by changes of life style, and in order to be able to treat them, it is necessary to first understand their causes. Tomáš Boněk: Religion can be considered as an important aspect of a healthy life style. Rhythms of the day, the week, the year and their festivals accompany religious practice. Special moments in life can be made conscious and internalized through experiencing the working of rituals which mirror and embody the spiritual realities. How can the spiritual life of children be formed today? What is embodied in the Sunday children’s service? Can religion also cause illness? How can the healthy religious life assist in healthy childhood development? In this work group we will inquire into the laws governing the formation of teeth from the Anthroposophical perspective. Tooth formation will be regarded as the imprint of the individuality of a person, as a specific manifestation of their being. We will mostly focus on the relationship between orthodontic anomalies and their soul-spiritual causes. How can we, using our understanding of anthropology and human development, prevent the malformation of occlusion and the bad positioning of teeth? In the group we will differentiate between tooth anomalies, bad tooth formation and the available corresponding medical or pedagogical aids. First we shall introduce Anthroposophy from a practical point of view – in its various applications and its practical results in different areas of human activity such as biodynamic agriculture, Waldorf education, Anthroposophic medicine, curative education, architecture, art, socially aware banking or Anthroposophical higher education. Afterwards, we will discuss the foundations that gave rise to those particular initiatives: What is Anthroposophy and what is its relationship to commonly known natural and social sciences? What is the anthropological basis of Anthroposophy and what is its theory of knowledge (cognition?)? Furthermore, we will focus on our everyday reality and use it to deduce some of the underlying Anthroposophic theories, such as the threefoldness of human nature (body – soul – spirit), the fourfoldness of man and the world or the polarity of being asleep and being awake in its deeper context. We will then observe how those concepts translate into medicine. We will focus on questions regarding the origins and the character of processes that later cause illnesses, and respectively on those that provide us with health. Last but not least, we will introduce some basic treatments and procedures of Anthroposophic medicine that can be used in everyday life by each and every one of us.